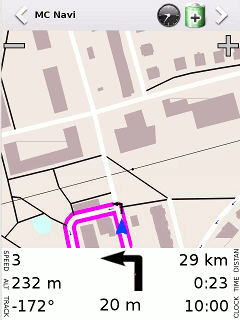 MC Navi is GPS navigation system aimed at portable devices like Neo Freerunner using OpenStreetMap as map source. It uses Enlightenment Foundation Libraries (EFL) for graphic GUI, so it is fast and light. In future it may be ported to other devices. The software uses OpenStreetMap (OSM) as source for maps licensed under Creative Commons Attribution-ShareAlike 2.0 license. From OSM wiki: OpenStreetMap creates and provides free geographic data such as street maps to anyone who wants them. The project was started because most maps you think of as free actually have legal or technical restrictions on their use, holding back people from using them in creative, productive, or unexpected ways. In other words: everyone can make the map better and everyone can use it. Any changes in infrastructure can be carried to map very quickly, the new map can be used immediately. So you do not need to wait months for map update from commercial subjects. Also you alone can make the changes, so if you find any bugs in map nearby, you can fix it. And it is very desirable! Extend the map in your neighborhood and help others traveling to you. And they will help you. That's the philosophy of OSM. MC Navi is also free, released under GPL v3 license. But if you find it useful and want to support the author, please donate some money. It is up to you the amount you choose, solely the price of beer in your country will be nice. Negligible amount for you, very helpful for author. Also if you want support and some improvements, it will be very motivated. It is easy, just click on the donate button. MC Navi is (will be) GPS navigation software for usage in trucks, cars and outdoors with bicycles and foot. It uses different parameters for different vehicles, so it gives different optimized results for all of them. Currently not all planned features are implemented, but it quite usable. And download and add public sign key. Then install package mcnavi-osm2mcmap on your main computer (AMD64 or i386) and mcnavi on Neo Freerunner. must be run in this order! For Europe the easiest way is to use pregenerated boundary data from here. In new version the converter uses MySQL database to store the data. Previously it loaded all data to memory, so no large maps could be created. The connection to MySQL is done on local host, user and password is "osm", database is osm, so create corresponding schema and user account in MySQL. In future releases it could be possible to change it via command line parameters. The simplest method is to download map from here or from here (currenly only old version maps, thx to Davide Scaini). Or just run mcnavi if you copy the map to /usr/share/mcnavi/maps/map.mcm directory (must be named map.mcm). In future it will load all maps in that directory and route between them, but currently it is not implemented. The usage should be as simple as possible. Some config will be made with text file (see bellow), in GUI only the controls needed for usage, so don't expect complexity of menus like in other navigations. On the other site, MC Navi will be useful for many activities - car navigation, also cycle and outdoor navigation and sport activities. 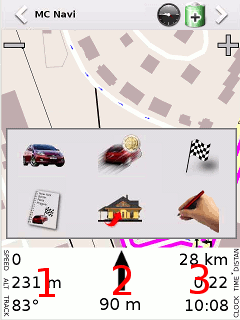 MC Navi is multithread application, where each task has own thread - GPS runs one, also map render, navigation and GUI. Some notes to routing. 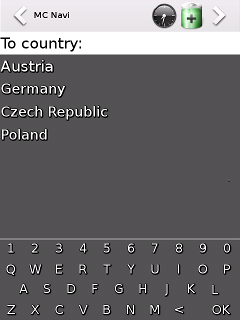 Routing menu has two rows of icons,. First row sets parameters, second makes actions. Routing is done between current position on map and destination. It is possible to set more destinations, second destination routes from previous destination. After routing to destination, we can adjust the route with waypoints. This is point on map, we want to pass through. This is not the next destination, instead waypoint will be added between start/destination/waypoint and destination/waypoint for nearest route segment. The route will be recomputed to pass the waypoint. This is useful especially for outdoor navigation, if we want to set route on specific roads and positions. After that, the route can be saved for later usage. So you can plan the route at home and use it next day in practice. Another route point is direction. This is point mark, that we can ride nearby, but is not placed directly on road, so we cannot reach it. Direction mark just gives instruction, that we want go another way. Routing point is set to bookmark/address or set by hand on map - click-routing. 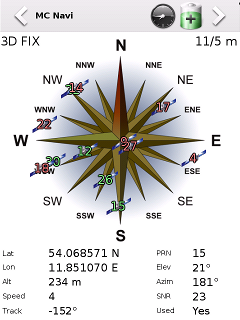 This is useful especially for outdoor - to plan exactly the route with waypoints. It is possible to configure some parameters in config file located at /usr/share/mcnavi/mcnavi.conf. The description is inside the file. All settings can be overridden with user specific config file located at ~/.mcnavi/mcnavi.conf. MC Navi is work in progress and is at the beginning of development. It may be unstable and all functionality may not be present although it seems to. Any questions? Ask in the forum. That's all for now. More in future. * mcnavi: added "click routing"
* mcnavi: replaced route menu items "route from to" and "route to"
with "stop route" and "route to address"
Powered by phpBB-nuke. All rights reserved. Stránka generována 0.409 vteřin, 25 SQL dotazů.